Love your story and your Motorette! I am a collector and historian of vehicles like the Motorette known as autoettes. I blog about them at autoette.blogspot.com and am writing a book as well. Someday I hope to find a Motorette to bring back to life. 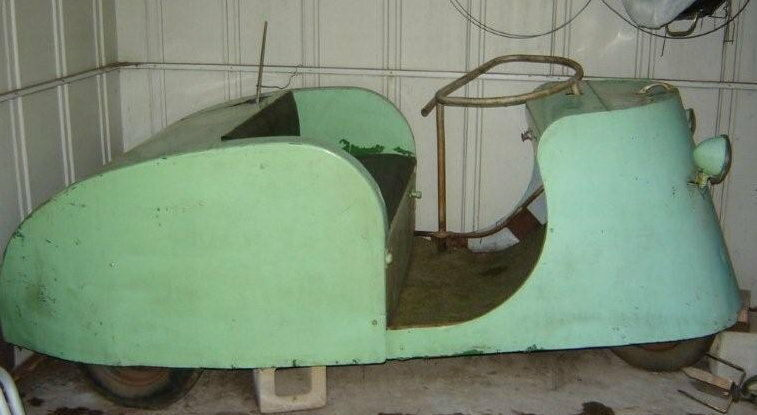 Nice Motorette….I have a similar story about one that my Dad had. I have it now, along with lots of interesting information about it. I would be happy to pass some of that along to you, including one of the original sales brochures for it. by the way, mine runs and I would be pleased to provide some advice to get yours running as well. You will hear from Kendall that I have become the next caretaker for the Motorette. A little over a week ago I was able to get the Motorette running. I would be very interested in sharing any information you might have and that Kendall’s family has shared with me. Please do contact me off line on my email. Thanks, I was just working on a new post about what happened with the Motorette. It’s been a rewarding story. Will have that up soon! I just read your post on your Dad’s motorette, I remember one in the neighborhood where we lived in the summer of 1946, I would walk around it thinking how wonderful it would be to have one! Little did I know many years later I would find one on its way to being scrapped! After many years I have restored it to like new condition and drive it around the neighborhood with my grand kids. I have pictures of mine if you would like to see some. As you will see above, I am now the steward of the green Motorette. It’s been an interesting journey and today, we now have three Motorettes and a matching aluminum trailer. The other two cars and trailer were on their way to the scrapper, relics from the estate of an man who hoarded all sorts of mechanical things and kept the two cars in a collapsing chicken coop. It took two days to get the cars from the coop to the curbside where we could load them. I would be very interested in seeing pictures of your Motorette and its restoration. I have been trying to connect with other Motorette owners since acquiring Mr. Dunkelberg’s car to compare notes and information as well as just know there are others like us out there. Good to hear from you again, Larry, and good to hear Ken’s story. I, too, would be interested to see pictures of his Motorette, and I’m amazed you found a couple of others to rescue from the scrap heap. Hopefully they won’t be too hard to restore, though I imagine part of the joy is in the challenge of restoration. Please contact me at my email with your questions. I have information on parts, etc. I can share with you via email. I am purchasing a storage unit with an Autoette. I know nothing about them, but the more I see, the more I like. I have a couple pictures I’d love to send. It’s in poor condition; I’m not interested in restoring it. I will likely need to find someone who can appreciate what it is and make a project of it. Please let me know if you think you can help me. Thank you. I can’t help much with finding someone to restore your Autoette, but there may be someone who’s interested and will reply here or email me. I’ve had a few comments by people who wanted to find a Motorette. They might notice and inquire. Let me know if it is identical or if it’s a different kind (Autoette is the more general term for this type of vehicle).